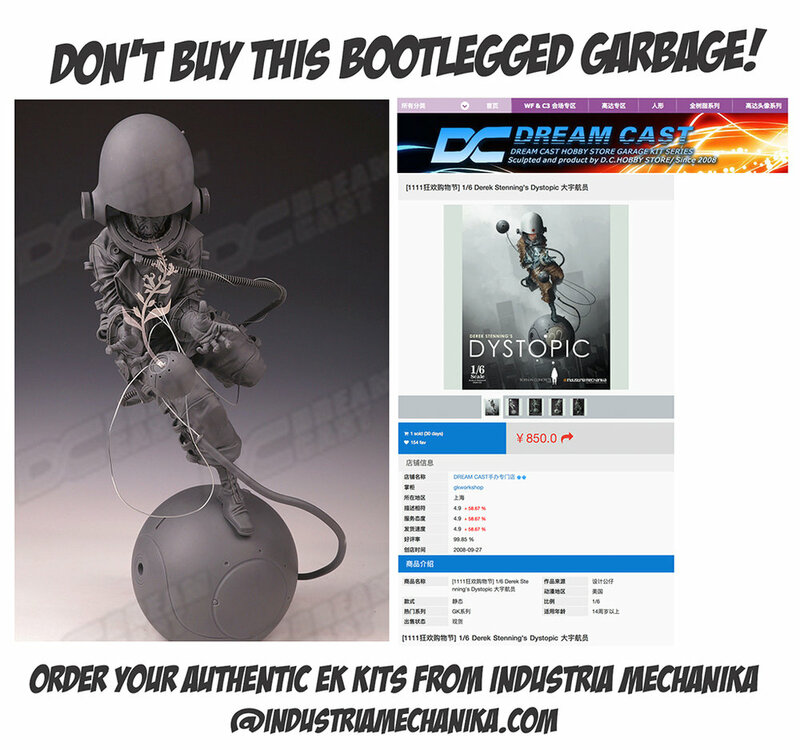 The Dystopic model kit is back in stock at Industria Mechanika! 1/6 scale resin with etched metal parts, metal wires, decals, and high quality casting. The real thing....not that bootlegged garbage! Get one at the IMech shop here. 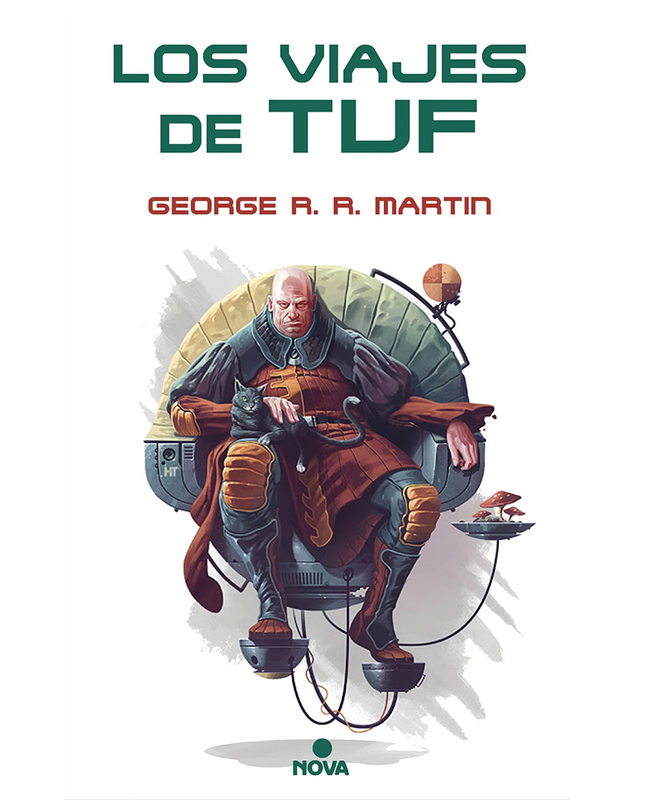 My illustration of Haviland Tuf, George R. R. Martin's cat loving space adventurer, has been licensed for the cover of the new Spanish language edition of "Tuf Voyaging"! I did this illustration a few years ago for Wired Magazine (for an article regarding the publication of a new edition of Tuf Voyaging for the English market), so it is cool to see it used again. The book is available now and published by Nova/Penguin Random House. Thanks to Joana Lopez at Penguin Random House. Book display at the Libreria Gigimesh in Barcelona, Spain. Life has been pretty chaotic for me so far this year, so I'm catching up on some older news...but here is an interview I did a few months back with Spanish design/illustration magazine Gràffica. We discuss how I got into art, my career path, working with Nintendo and Microsoft and the EK Series. Anyways, check it out here. I hope you can read Spanish! Thanks to Alicia Juan and Graffica! I recently became involved in a project that requires/affords me the opportunity to dive back into my Entartete Kunst work to create a few pieces that, for various reasons, I had omitted from the first series. This is the first one that i have finished...and I won't get into any details regarding the project here, but there are a few more new EK images coming down the pipe in the near future. Years ago I designed a group of mascots for Vancouver based game developer Next Level Games. These simple, graphic characters, known as the NLG Family, were created to represent different aspects of the company's culture and were used in internal branding situations. As the company celebrated it's 15th year, they asked if I would design a new "family member", one that would encompass some new traits that the company has picked up along the way: wisdom/experience, awareness and consideration. After several design rounds Mr. Bodhi was born. He is meant to be jolly and wise so visually he is somewhat reminiscent of Budai, the Laughing Buddha, and his silhouette is meant to be similar to the Mandelbrot Set. His long flexible arms enable him to hug any sized frame and his colours are warm and inviting. It was a little challenging designing a character to fit in with a group of designs I did so many years ago...but in the end I think he turned out pretty well. 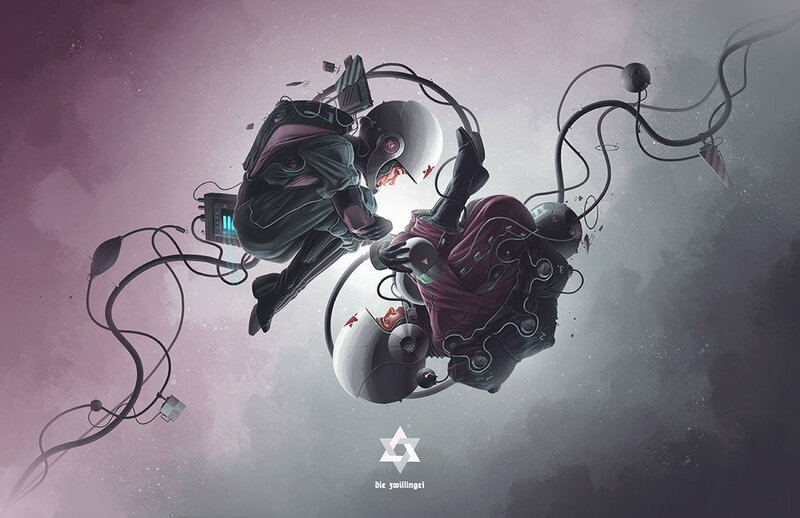 The piece was created to celebrate the birth of the client's twins, a boy and a girl. The composition is similar to the Taijitu, the Chinese yin and yang symbol, and encompasses the idea of individual forces that are seemingly opposed are also complementary and interconnected. As with other personal commissions I've done in this series, the final image was printed as an archival quality giclee on fine art paper. Thanks to Matthew and Terry! Head over to Industria Mechanika to pick one up! All three 1/8th scale EK Cosmonaut kits are back in stock over at Industria Mechanika (I think this is the first time all 3 kits are available at the same time). Expertly sculpted by Gene Campbell, and produced by Industria Mechanika, these are great, high quality garage kits. As I mentioned in a couple previous posts, bootlegged versions of these kits appeared last fall, but you can be sure that these are the real thing! So if you need a kit or 2 to complete the series, or if you are looking for a full set, now is the time to pick them up! More details here at the Industria Mechanika shop! Here is a cover I did for Cyrus Longbones and the Curse of the Sea Zombie, the first book in a young readers series by Jeremy Mathiesen. This one was fun to illustrate, as there was a lot to pull from Jeremy's story.....an action packed adventure with an interesting setting.....think Pirates of the Caribbean meets Keepers of the Maser. Jeremy wanted a murky-like feeling...which worked well with my desaturated, hazy style. I also had the opportunity to create the logo and tag-line wordmark. Cyrus Longbones and the Curse of the Sea Zombie will be available later in the year from Viking House Publishing. MORE PRINTS IN THE SHOP! Some more prints have been added to the shop! All are high quality limited edition giclees printed on fine art paper. Signed and numbered with a certificate of authenticity. Various sizes, shapes, etc. Check them out in the shop! I've started an Instagram page to post images more regularly....EK stuff, other side projects, material from abandoned projects, sketches and other musings. I hope to get some new material up on there as well and maybe some process images. Time will tell. The EK_02 1/8th scale resin model kit is back in stock at the IMech Shop. Expertly sculpted by Gene Campbell and produced by Industria Mechanika! Bootlegged versions of this kit surfaced last fall....but this is the real deal! I'll be participating in the judging panel again for The Rookies, an international awards competition for artists, designers, animators, creators, etc. Entries have to be submitted by this Monday, May 29th. Every year The Rookies hand out a bunch of great prizes and paid internships to some of the top studios in the field. Winners should be announced in July. You can check out the current entries and the judging panel here. Here is a cover illustration I did for the book "Renegades", the third instalment in the Randoms Series by author David Liss. This one is another great science-fi adventure, with Zeke and his friends continuing their adventure, traveling to strange worlds, encountering bizarre beings, battling aliens, while learning and growing along the way. Plus there is a dose of tween romance thrown in there for good measure. Anyways, the cover was a lot of fun....being a wrap around image like the previous books and featuring portraits of David's great characters from the series in a circular graphic arrangement. This one was a little different in that it contains 2 different locations....one on the front cover and the second on the back, whereas the previous 2 books featured singular locations. This also introduced more colour...but in the end I still think it fits with the other covers. As with the previous instalments in the series, I created the title word mark for the book. Renegades will be released in hardcover next September. Thanks to Lizzy Bromley at Simon & Schuster. The 1/8th scale EK Cosmonaut 01 and 03 kits are coming back for another run and are now available for pre-order over at Industria Mechanika. The shipping ETA of these kits is May 2017. Lower quality boot-legged versions of these kits were circulating last fall so if you've been looking for an authentic version, now is the time to pick one up. For more info. and ordering, head over to Industria Mechanika here. I'm happy to announce a new model kit I have in the works with Industria Mechanika, the 1/6th scale Duchess. Sculpted again by the talented Gene Campbell, this figure was conceived as a companion piece to the popular Dystopic kit. Production on this figure has begun, so hopefully the kit will be ready for pre-order and release sometime later in 2017. I'll post updates in the future! Here is a short interview I did recently with creative networking site Movidiam. In the podcast we discuss working in the games industry, networking and my Enartete Kunst art project. You can listen to the podcast here. or, if you prefer, you can read the print version here. A couple months ago I posted some character design/illustration work I had done for the Supertruck expansion to the racing game Anki Overdrive.... and I recently received permission to post some more of this work. So I've added an Anki Overdrive section to my website. You can check it out here. All images copyright Derek Stenning and their respectful owners.